Speakers for the training were sis Cindy Gan from Full Gospel Assembly, KL and sis Betty Yong, from SIB KL. The two-day training sessions brought many men and women from outside and around Kuching. Sis Betty Yong at one of the exercises. “Teaching and parenting children are acts of worship that is pleasing to God,” she said. In the first part of the session, she talked about what a transformed teacher was. “Our goal is to be like our Master Teacher, Jesus,” she said. To be a transformed teacher, one needs to teach like Jesus did and know His character as a teacher. “Seek to be teachable,” she said. Teachers who are teachable are committed to Christ, love children, are prepared to teach, always ready to learn, knows and lives God’s Word, and are empowered by the Holy Spirit. Jesus as the perfect example of a teacher. Teachers also understand their gifts. “The teacher with the talent of teaching can communicate truth and impart knowledge. But it is the teacher with the spiritual gift of teaching, who can take knowledge and help the child grow spiritually with information,” she said. They can transform lives for Jesus Christ. 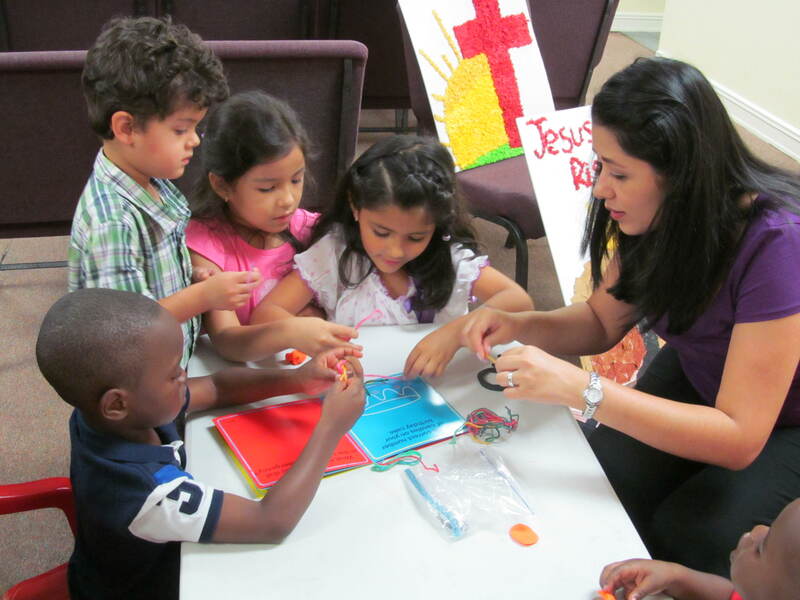 Sunday School teacher ministering to children. Next, understand your mission. “Our mission is to relate what Jesus commands in His Word to an increasingly complex world, to make disciples in this world,” sis Betty continued. Teachers are to be a light for others; transparent and trustworthy. “What goals do you have for improving yourself as a teacher?” she asked. The other topics covered during the first part of the session covered leading children to salvation and strengthening their Christian walk, leading them to God’s presence through praise and worship, understanding children development, and teaching methods and discipline. Participants at the training session. Sis Betty Yong and sis Cindy Gan took turns to teach in the sessions. The sessions included prayer and ministry time. Participants came from SIB Central City, St Swithun, Kg Payang; Church of Holy Spirit, Kg Rituh; St Andrews Chapel, Kg Skuduk; St Francis, Kota Samarahan; St Thomas, Kuching; St Edmund, Mundai; All Saints’ Chapel, Plaman; Nyabet, Serian; St John Parish, Taee; St Paul Chapel, Kg Tarat Melawi, Serian; St Helen’s, Serian; Tian; St Paul, Siol Kandis; Merakai Agape Chapel, St Boniface, Meboi; St Peter, Selabi; and St Luke, Bayor. The training on December 6-7 was conducted primarily in Bahasa Malaysia with English translation.